It's fair to say that everyone who follows boxing is looking forward to May 2nd and the long awaited mega-fight between Manny Pacquiao and Floyd Mayweather Jr. Before then however we are set to get a lot of other action, with the first title fight of the month coming on the Friday prior in Japan where the exciting Takashi Miura (28-2-2, 21) gets to defend his WBC Super Featherweight title against Australian challenger Billy Dib (39-3, 23). Coming in to the bout Miura is a fighter seeking a win to “break out”. At the moment he's a world champion but one who is often seen as being in the shadows of the popular Takashi Uchiyama. He's scored himself notable wins already, including a 2013 FOTY contender against Sergio Thompson, but hasn't been able to really capture fans like his WBA title holding compatriot. As for Dib he's a man needing a win of note to just remain relevant in the world of professional boxing. Internationally the more well known of the two men is Dib. He first made his name at home in Australia, where he fought many of his earliest fights, before going to the US to challenge the then WBO Featherweight champion Steve Luevano in 2008. Although Dib came up short against Luevano it wasn't long until he got another world title fight and over-came Jorge Lacierva for the IBF Featherweight title. Unfortunately for Dib his reign came to an end just 20 months after winning the title as he was beaten by the then unheralded Evgeny Gradovich in the US. It was a bout that saw Dib losing his biggest drawing factor internationally and worst of all, frustrating fans with a performance that was ugly to say the least. Since that loss Dib has failed to really reignite his career and struggled past Mike Oliver before being stopped in a rematch with Gradovich, on the Macau card headlined by Manny Pacquiao's bout with Brandon Rios. 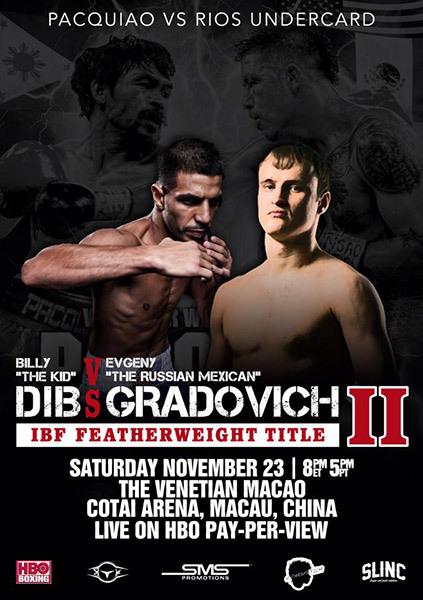 For many fans they expected Dib's loss to Gradovich to be the end of him at world level. The Australian boxer-mover was only 28 but already looking like a fighter who was done. He has however picked up 3 low level wins and got himself back into contention. In the ring Dibb is a spoiler. He's fast and has got some real skill but seems to be happy to make things ugly and frustrate his opponents. At his best he's a fantastic fighter but his best days appear to be behind him and appear to have come against relatively poor opponents, opponents who were unable to cope with his speed, power or style. At the world levels he's never quite looked like fitting in and his IBF Featherweight title reign was disappointing to say the least with defenses against the little known Alberto Servidei, a little known Italian who was finished inside a round form a body shot, and Eduardo Escobedo, a Mexican who retired after 6 rounds of a messy and foul filled bout. Whilst less well known internationally Miura is a man who is carving his way through the Super Featherweight division and taking no prisoners. He was first noted as a puncher in the amateur ranks where ran up an impressive record of 34-6 (22). Since turning professional in 2003 he has shown that same power and went 12-0-1 (10) before suffering his first loss, in a Japanese title fight to Yusuke Kobori. Despite his power it wasn't until his third Japanese title shot that he finally won and at one point it seemed like that was going to be where his power “topped out” with a number of distance bouts occurring when he faced the top Japanese contenders of the late 00's. In 2011 we finally saw Miura fighting at the top level as he took on the WBA champion Takashi Uchiyama in a world title fight. Miura did come up short, with a badly swollen face forcing his retirement in that bout, be he had impressed, dropping Uchiyama hard in round 3 and showing his heart through several painful rounds. It was a loss but one with an upside as it saw Teiken taking an interesting in Miura and signing him up, where he has been ever since. Not only has Miura signed with Teiken but he has flourished having won all 8 bouts since the Uchiyama contest. Those bouts have included his world title victory against Gamaliel Diaz, his enthralling war with the tough Sergio Thompson, his 1-sided destruction of the horrible over-matched Dante Jardon and a beat down of the heavy handed but limited Edgar Puerta. Wins over 4 successive Mexicans has seen Miura become a new “Mexicutioner” though in all honesty we suspect that he's going to have the beating of almost anyone in the Super Featherweight division. He has the style, power, aggressiveness and toughness to give everyone and anyone a tough bout and although he is flawed and he can be hurt he's a very hard man to beat, especially now that he's began to fulfil his potential. When the two men get in the ring we're expecting to see a number of differences between the two men. Firstly we expect Dib will be quicker, it wouldn't be a surprise to see Dib land the first punch of note, or in fact the first few punches of note. On the other side Miura will be the much stronger, bigger and tougher man in the ring and we suspect when Dib tries to get dirty he will be brushed aside, the hugging and holding will be punished by powerful short shots. At the end of round 4 or 5 Dib will be getting bullied around the ring whilst Miura will be looking to land his potent left hand and within 8 rounds he'll have stopped Dib who we expect will look a beaten and broken man. We might be wrong but really do see this as a mismatch with Miura having almost all the advantages and Dib being the sacrificial lamb to the champion who deserves a lot more attention than he's been getting from western fans. Hopefully, if we're right, we'll see Miura in a super fight later in the year against the winner of the upcoming WBA “super” title fight between Takashi Uchiyama and Jomthong Chuwatana. That bout promises to be a lot more competitive than this one and if the winners were to collide it really would be the best fight to be made in the division.